I can't believe this year is going on its third year?? And it's not really getting better, just bigger??? Well, with the recent announcements of expansion (in Okinawa and to the parking lot next door for Nintendo World), it's no surprise that USJ is trying to keep its name hot in these streets. And with the downer that is winter, they do have an advantage in getting us excited for something that isn't cold and wet. 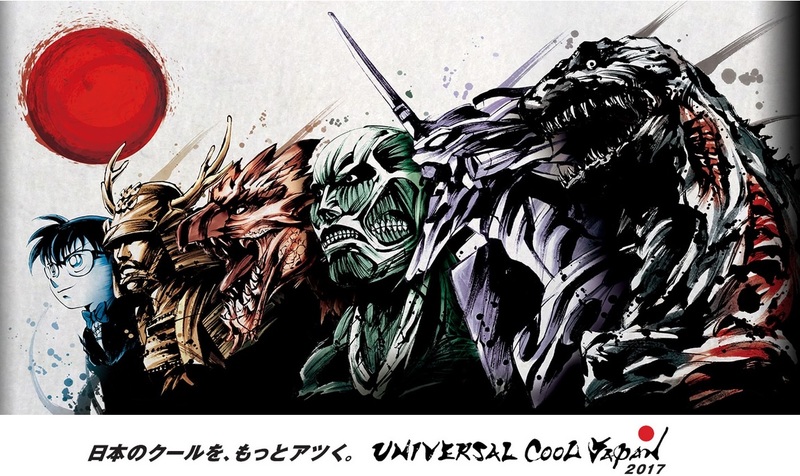 So this year, Cool Japan will not only take place in Universal Studio Japan's park, but also at Osaka Castle Park (no, they're not close to one another). Osaka Castle Park is off of the subway line and JR loop line, but the area used for the Cool Japan event will be closer to the subway. More on that below. USJ is still on the Sakurajima JR Line, so please remember that you need to transfer at Nishikujo Station. I liken this event to a live, musical re-enactment of the Sengoku era of Japan. According to what is written on the site, "with a theme based on the popular war tactician Yukimura Sanada, enjoy the intense and thrilling excitement of the Battle of Osaka". This is the battle where Osaka fell and the Tokugawa Shogunate rose to power mind you, so there is no happy ending (spoiler alert). I'm always confused as to why Osaka likes talking about the battle that they lost to a treacherous child murderer, but hey, not my history. First up for Cool Japan 2017, we have the crowd favorite, Evangelion. Between this series and AoT, you can spend your entire day at the park, standing in lines (unless you're a rich fellow and can afford express passes). Based on the description, it sounded like MX4D, with an IMAX-type screen, but actually, they've just taken the Space Fantasy indoor roller coaster and strapped VR goggles to your face. So like the Kyary ride from last year's Cool Japan, but less pink and frilly I suppose. There's also a smartphone application that you can mess with while you're waiting in line. I'm sure this is to distract you from the several hour wait, which really wouldn't be so bad if it hadn't been below zero these past few days. I doubt anyone even wants to use their fingers for anything other than keeping their pockets company. Tickets for this event will not be sold separate from the Express Pass booklet, but there are quite a few reasonable options available. A set with the Attack on Titan attraction OR Godzilla attraction (so a 2 attraction set) will only cost you 2,400 yen. It's also available in the Cool Japan Express Pass 5 and Express Pass 4 booklets for 6,900 yen and 4,400 yen respectively (there is also an Express Pass 7 booklet with HP land tickets for 6,900 yen). There's your usual bevy of merchandise available, though I'm not quite sure what these are doing. I assume they're related to eating. But I think your money would be better spent on more simple items like pens and keychains. I don't know who this "me" character is, but unless he plans on transforming into Ultraman, I feel like this isn't much of a fight. That won't stop USJ from making an attraction from it, though! According to the description, though, you're actually in some kind of aircraft, going after Godzilla (misleading much, photo?). You follow Godzilla via this aircraft over Yodogawa and through the fashionable buildings of Umeda. Unless you're familiar with the Osaka landscape, I doubt any of these areas mean anything to you. I would say that this is one of USJ's least foreigner-friendly, or even Japanese-person-outside-of-Kansai-friendly, attraction. Not the most flattering Godzilla shot. Not the most exciting attraction, but I think USJ is trying to strike a middle ground with something that can be enjoyed by the whole family. There's no particular age or height requirement, and it looks like it's being played in one of the 2 3-D theater (probably The Shrek/Sesame Street one), which might be a quiet indicator of its content. There is a warning about violent scenes, but I'm sure that doesn't differ much from your normal Godzilla viewing experience. There will be goods and snacks available. 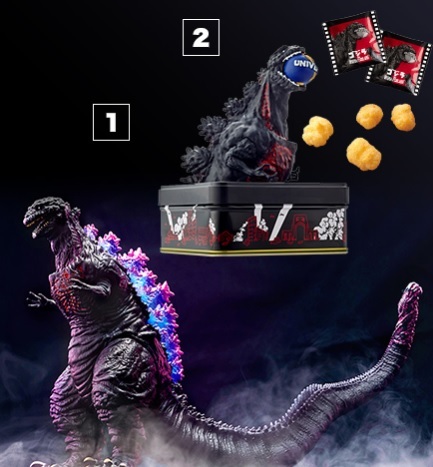 The dinosaur/mutant dinosaur collectors will rejoice as the Godzilla toy (1) looks pretty awesome and even the souvenir snack box (2) is pretty cool. Tickets are available through any of the Cool Japan Express Pass booklets. It doesn't look like you'll be able to try this attraction without one. 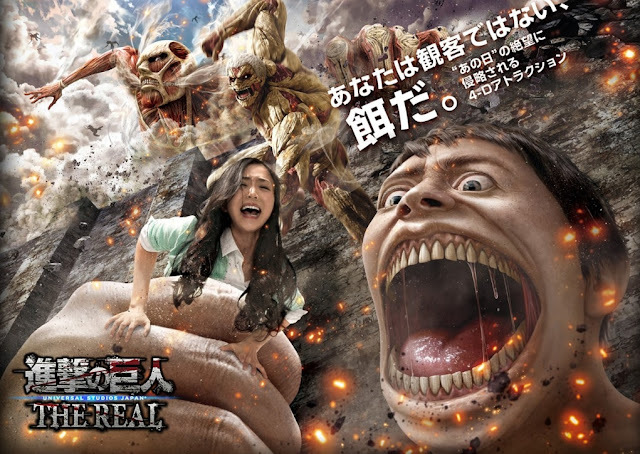 The perennial Cool Japan attraction, Attack on Titan, has been here since the Cool Japan venture began and despite the movie bombing and the newest season being delayed for a year, I guess people still want to experience being eaten by a Titan. This attraction takes place in the Terminator theater, so it'll operate like MX4D. That's not so fantastic, but the theater is quite large so that means more folks will get a chance to try to the AoT attraction than in previous years. 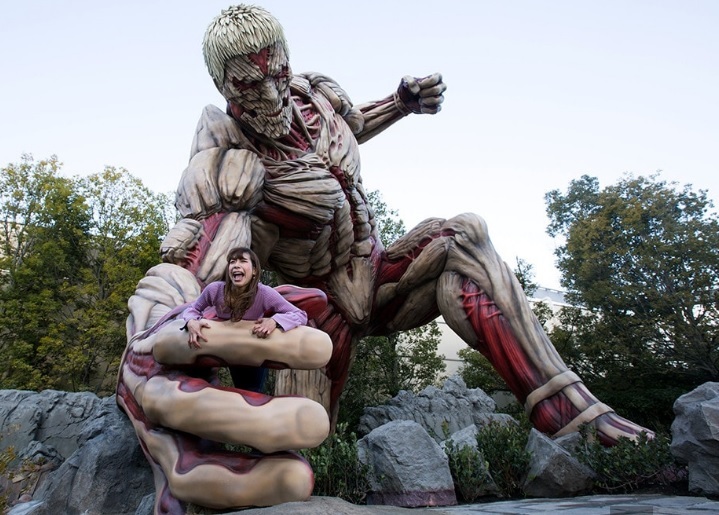 The story is a park original and features to Titans, one super Titan and an armored Titan, coming after you (guys). As far as I can tell, none of the characters from the series make an appearance (which is different from previous incarnations), though I assume soldiers will come to your rescue. There will be a photo op with the armored Titan in the Cool Japan area near the entrance, with food and cosplay goods also for sale. Tickets for this event appear to only be available through Express Pass booklets. This attraction came as a real surprise to me and is a big sign that they're mostly focusing on the Japanese guests (despite Cool Japan being an initiative to spread Japanese pop culture around the world. guess they forgot that part). Detective Conan has been around for ages and is popular with Japanese fans of all ages. The films are aired on television regularly, with new ones coming out on a seemingly yearly basis. I've seen a couple movies and don't see the appeal, but hey, to each their own. 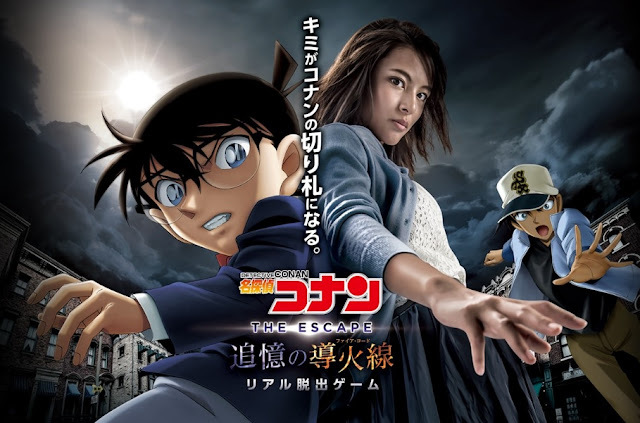 In this attraction, you work together with Conan to escape in 60 minutes (it is an escape game, so you need to speak/read Japanese to get the instructions). The story is original to the park and revolves around a series of murders that have taken place in Osaka Prefecture. Also, apparently you have a bomb attached to you?? 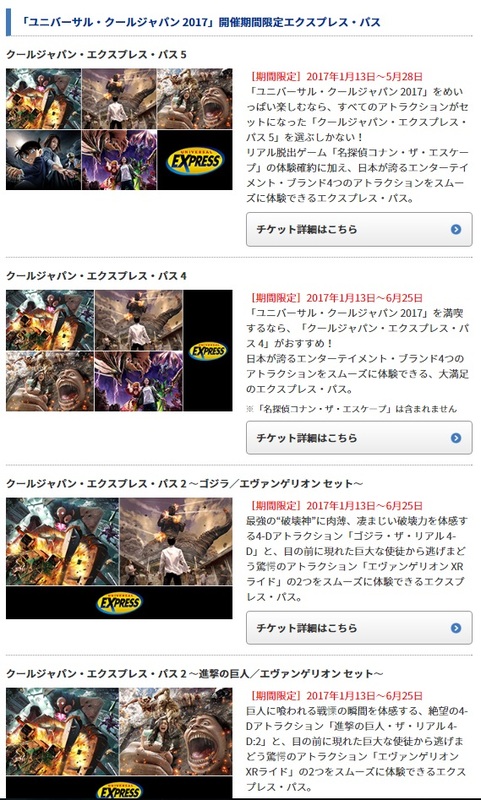 So you have to work with Conan and the detective of the West (staff from USJ) so escape within the time limit. This escape game is produced by SCRAP, a well-known escape game company that puts on events all across Japan. 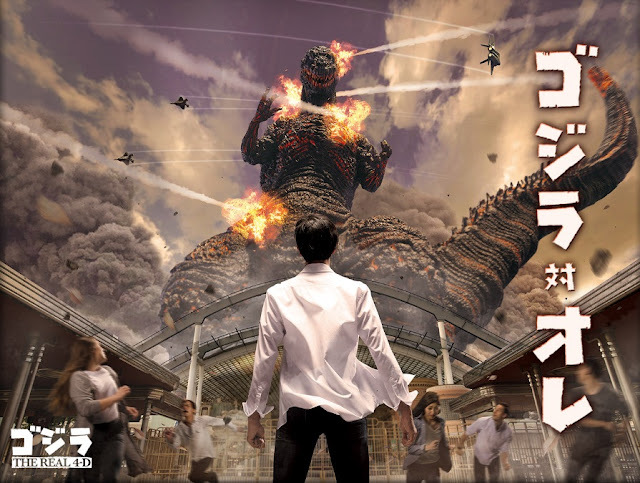 Also, since this attraction is not produced by USJ, it is considered a premium attraction and only accessible with the Escape game exclusive ticket or the Express Pass 5 booklet. Goods and snacks are also available for sale. 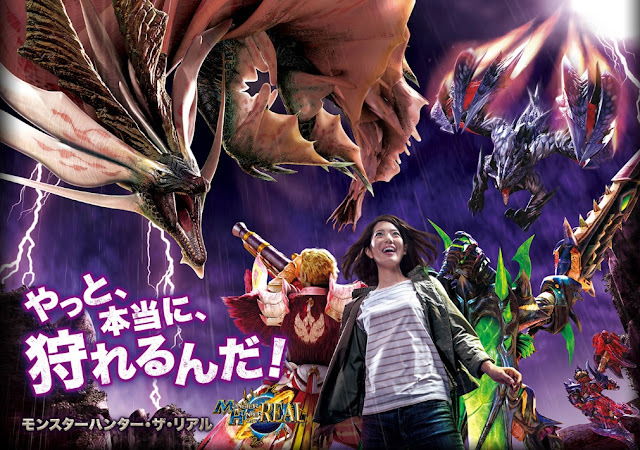 Another mainstay of the Cool Japan event, Monster Hunter is the only attraction I've been to in the 3 years that this event has been held (that's not true, I did DBZ last year). It's less attraction and more of walk-through some game props, but I still think it's a must-see for fans of the series. 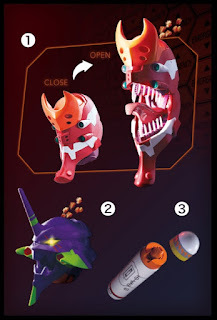 Downloadable content for players of the game will be available only for this attraction and there is also a time attack mode for players to win goodies like badges and stickers. 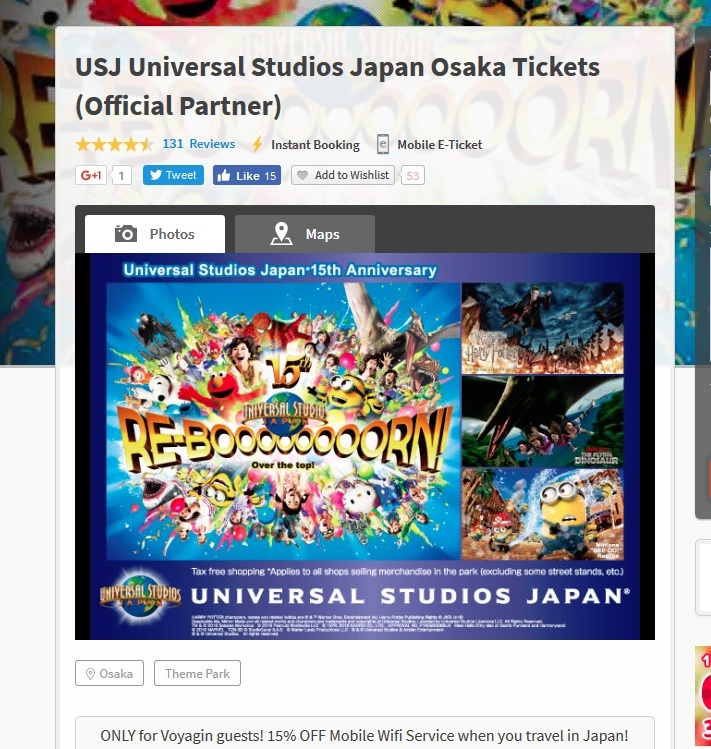 Tickets are available from USJ's web store for those with access to it, but you can also get tickets from travel companies like Voyagin, which offer booking information in English (the USJ web store is only in Japanese). 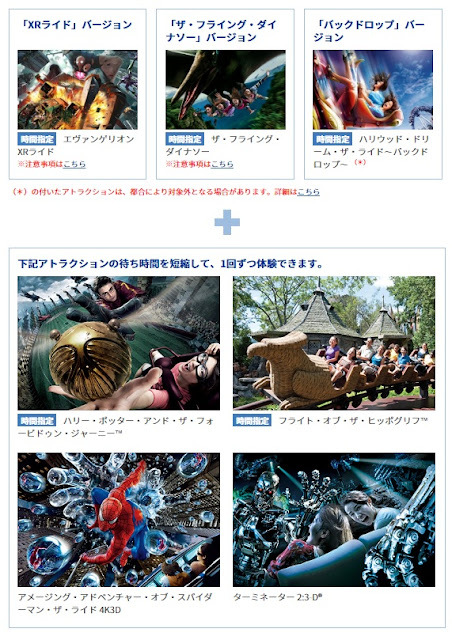 This attraction is the only one not listed on the USJ webstore. 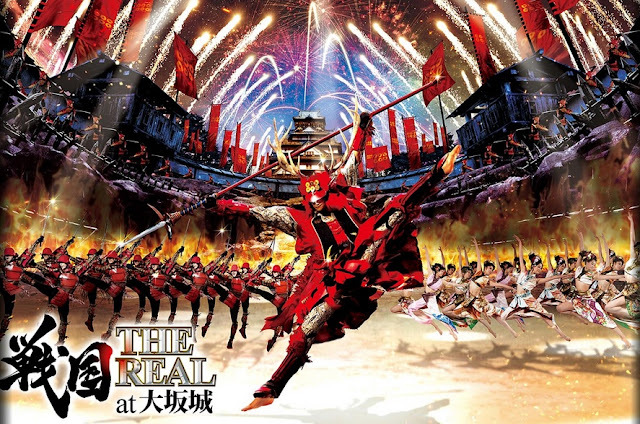 Instead, it must be purchased at the website shown above (link here: https://l-tike.com/st1/sengoku_webticket/sitetop). It looks shady, but this is the site you're taken to from USJ's web store. There doesn't appear to be an English site available, but tickets can also be purchased at Loppi terminals in the convenience store. 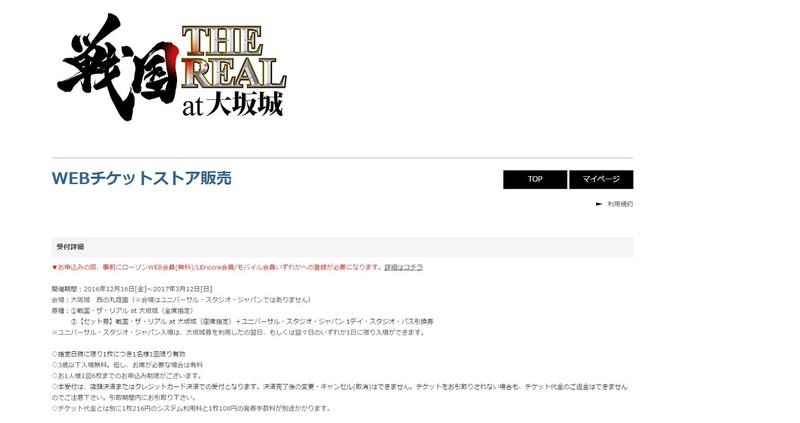 If you order the USJ park set, SENGOKU THE REAL tickets will be on a different day from USJ entry so that you don't have to worry about time. 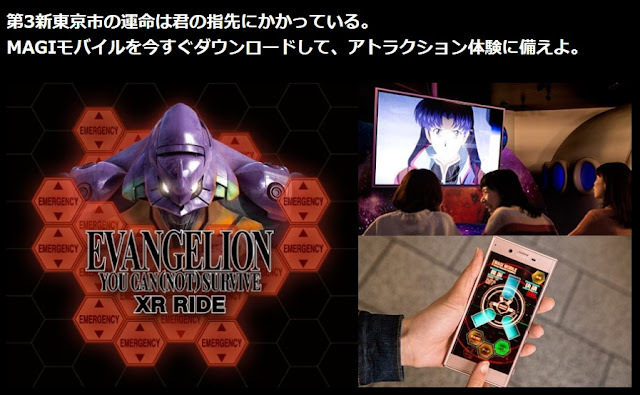 Includes entry to the Evangelion and Attack on Titan attractions only. 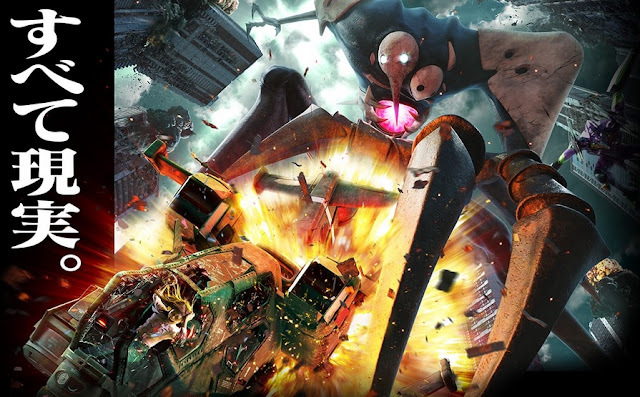 Includes entry to the Evangelion and Godzilla attractions only. NONE OF HE AFOREMENTIONED EXPRESS PASS BOOKLETS INCLUDE ENTRY TO WIZARDING WORLD OF HARRY POTTER. THIS ENTRY TICKET MUST BE ACQUIRED SEPARATELY. Here's where things get a little more complicated. This pass booklet may only include ONE Cool Japan attraction, but includes entry to Harry Potter and short wait times for other USJ attractions (for a total of 7 attractions). Voyagin is a travel agency that is now officially working with USJ to get you early access to rides and great deals. 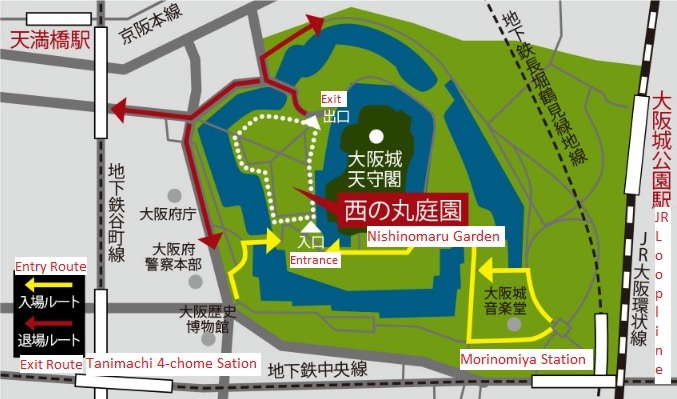 They'll help you get VIP tickets (allows early entry into the park, though the time varies depending on the day), and you may even win a free ticket to the HARUKAS Observatory in Osaka. I would definitely recommend this plan for warmer months when they have big events going on and the weather is nice all day. Starting at ¥4,750 for children, ¥7,400 for adults. I wasn't able to find any options for the Express Pass booklets on the main page, but options are available after you press the booking button. They may have add-on options for the Express Pass booklets there. I would also recommend getting in touch with them directly if you're looking for specific tickets, but can't find them on their website. Tickets are only valid for the day designated on the tickets. A park ticket must be purchased separately from the Express Pass tickets. Express Pass prices vary depending on the day. Express Passes can only be used by the ticket holder (you cannot ride together with your children on same ticket). Attractions with designated boarding times will have the times written on the ticket. If you miss your boarding time, there are no refunds and you cannot change your time. If you buy a Twilight Pass (enter the park after 3PM), you may not be able to use this pass. As always, questions, comments, and concerns can be left in the comments below! I'll get back to you ASAP!